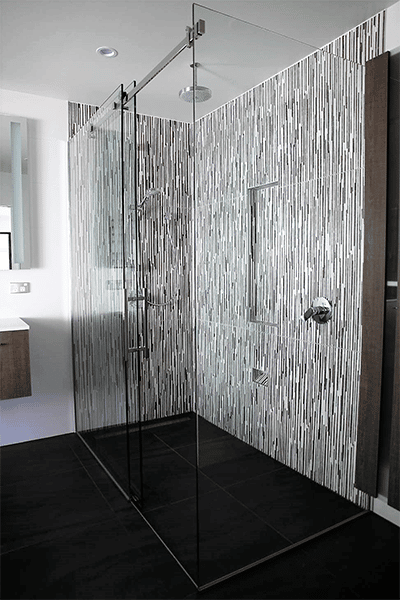 Home / Tiled showers – the new trend in bathroom design. Tiled showers – the new trend in bathroom design. What better way to add a touch of luxury to your bathroom than by including underfloor heating? With a bit of forward thinking, Warmup has a solution that delivers a fully waterproof bathroom as well as a complete heating system. So, what is needed in the planning stages? Founder and CEO Paul Fielding says that not a great deal is needed. If you’re using concrete as your substrate, instruction must be given in the planning and building stage to allow for a drop down in the bathroom to allow for the shower recess and correct levels to install the system later down the track. Fast forward, then Warmup will arrive at your site when the wall linings are on and all plumbing and drainage points are in position. The first step Warmup takes is to waterproof the entire bathroom using a sheet membrane. Insulated Marmox tile backer boards are laid down and the shower base and enclosure are installed. The heating is then laid across the entire floor area and the shower enclosure is pre-channelled for glass. The Tiled Shower Solution is so good you’ll need no other heating in your bathroom and you’ll have less condensation. You’ll also have the convenience of a fully programable digital touch screen thermostat that can be operated through a standard panel or Wi-Fi. It’s hard to believe all of this will run for the cost of one coffee per week. Impressively, the entire set up at Warmup’s end can be done in one day. Warmup believes in this product so much it has a lifetime warranty for undertile heating in your bathroom and they guarantee products, installation and waterproofing for 15 years.